The Ministry of Justice is controlled by the French Minister of Justice - Keeper of the Seals (Ministre de la Justice - Garde des Sceaux), a top-level cabinet position in the French Government. The current Minister of Justice is Nicole Belloubet. The ministry is headquartered in Paris. propose legislation affecting civil or criminal law or procedure. The Minister of Justice also holds the ceremonial office of Keeper of the Seals and, as such, is custodian of the Great Seal of France. This symbolic role is still shown in the order of words of the minister's official designation, "Keeper of Seals, Minister of Justice" (Garde des Sceaux, Ministre de la Justice). France's Ministry of Justice might oversee the administration of justice in French Guiana, French Polynesia, Guadeloupe, Jersey, Martinique, Mayotte, New Caledonia, Réunion, Saint-Barthélemy, Saint-Martin, Saint Pierre and Miquelon and Wallis and Futuna. In 2010 the prisons in the French Prison Service has one of the highest rates of prisoner suicide in Europe. ^ "Contact." Ministry of Justice. Updated on 21 may 2012. ^ Travaillot, Françoise. "French Ministry of Justice." Ministry of Justice (France). 15 September. 1. Retrieved on 6 May 2010. ^ "Juridictions judiciaires d'outre-mer". justice.gouv.fr (in French). Retrieved 2018-07-11. ^ "Mayotte". justice.gouv.fr (in French). Retrieved 2018-07-17. ^ "Saint-Pierre-et-Miquelon". Ministère des Outre-mer (in French). Retrieved 2018-07-19. ^ Living in Detention – Handbook for New Inmates – French Prison Service (in English). Ministry of Justice. Retrieved on 21 May 2010. ^ Davies, Lizzy. 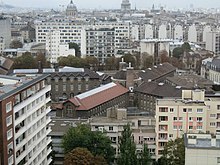 "French prison system under scrutiny after suicide." The Guardian. Monday 22 February 2010. Retrieved on 20 May 2010. This page was last edited on 19 July 2018, at 23:27 (UTC).